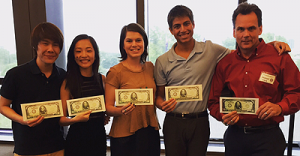 Four students from Bellaire High School have been named the national champions of the 2015 National Personal Finance Challenge, after beating out more than 22 other teams to earn the title. The competition took place in Kansas City on May 22, and students Christina Mao, Kenneth Yu, Claire Weddle, and Akash Shukla placed first, second, third, and fifth (respectively) in the country on individual tests before advancing to the third round of the competition, which was a team event. This entry was posted in Achievement/Recognition, District V - Sue Deigaard and tagged Bellaire, finance on June 1, 2015 by HISD Communications. April 25, 2013 – In an effort to provide taxpayers a guide to understanding the district’s budget, the Houston Independent School District is hosting a series of community meetings across the city that will outline the budgeting process from planning, to adoption and implementation. The meetings will cover key aspects of HISD’s budgeting process such as where the money comes from, how much is designated to each of the 276 campuses, who decides how the money is spent at each campus and who monitors the budget, among other topics. HISD’s General Manager of Budget and Financial Planning Sharon Eaves will be leading the budget presentations at the community meetings. This entry was posted in Budget, Parents and tagged budget, education, finance, HISD, Houston ISD, schools on April 25, 2013 by HISD Communications.